Students Identify With 50-Year-Old Supreme Court Case Teenagers in Washington, D.C., were inspired by a recent lesson in the First Amendment rights of students after three federal judges and their law clerks re-enacted a landmark Supreme Court case. In 1968, Mary Beth Tinker and her brother, John, display two black armbands they used to protest the Vietnam War at school. They came by subway, and on foot. Two hundred forty middle and high school students from Washington, D.C., public schools. Destination: the federal courthouse at the foot of Capitol Hill. They were there to watch a re-enactment of a landmark Supreme Court case on a subject that is near and dear to their hearts — the First Amendment rights of students. What they learned, among other things, was that history repeats itself, even in their young lives. This is the third time that the judges of the federal appeals court have invited students to watch a re-enactment of Tinker v. the Des Moines Independent Community School District. 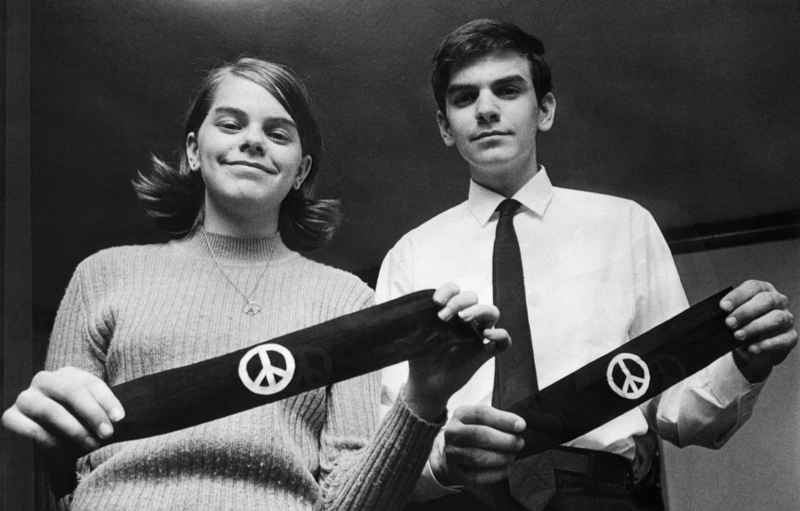 Tinker was 13-year-old Mary Beth Tinker, one of five students who in 1965 were suspended for wearing black armbands to school to protest the Vietnam War. Four years later the U.S. Supreme Court ruled by a 7-to-2 vote for Tinker, affirming the principle that schoolchildren do not "shed their constitutional rights to freedom of speech or expression at the schoolhouse gate." Students cannot be censored, the court said, unless their speech is disruptive. 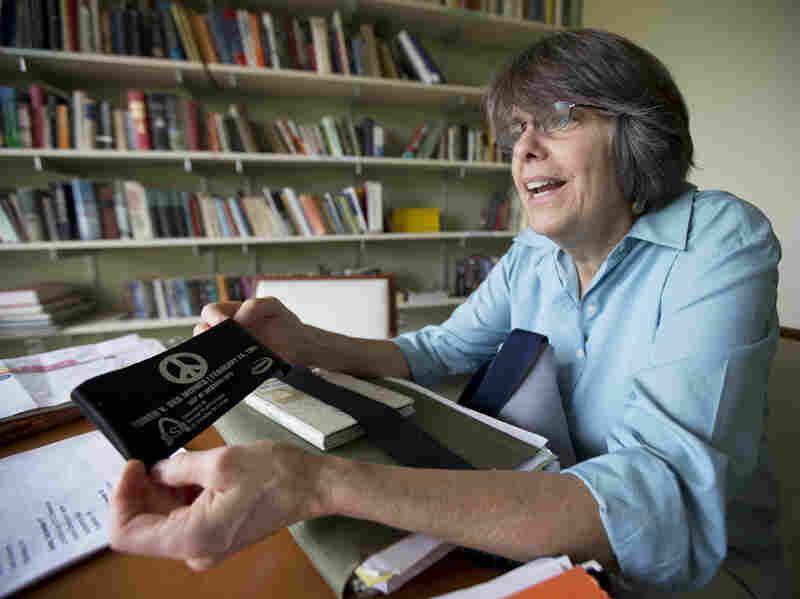 Tinker shows one of her collection of armbands during a 2013 interview with The Associated Press. 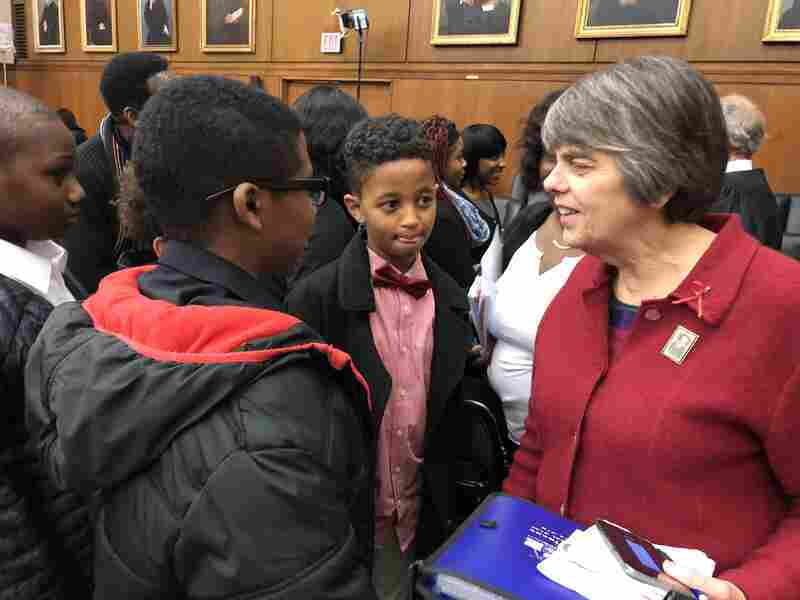 On this day in December 2017, Mary Beth Tinker, now 65, is in the courtroom, and Judge David Tatel acts as the chief justice, with two of his colleagues, appeals court Judge Sri Srinivasan and trial court Judge Ketanji Jackson, in the roles of associate justices. Tatel, as a private lawyer, represented school districts all over the country, and he loves these events, with kids whose parents are janitors or restaurant workers or accountants all riveted for an hour by the law. Before the re-enactment begins, Mary Beth Tinker takes questions from the students. Seventh-grader Muhamad Osman asks whether she had "any personal connections to anyone that was involved in the Vietnam War who inspired you?" "Where we got our feelings about the war was from the press," Tinker replies. "That's how we learned about the war and everything that was going on in the world ... and that's why we need to support the right of journalists because that's in the First Amendment also." 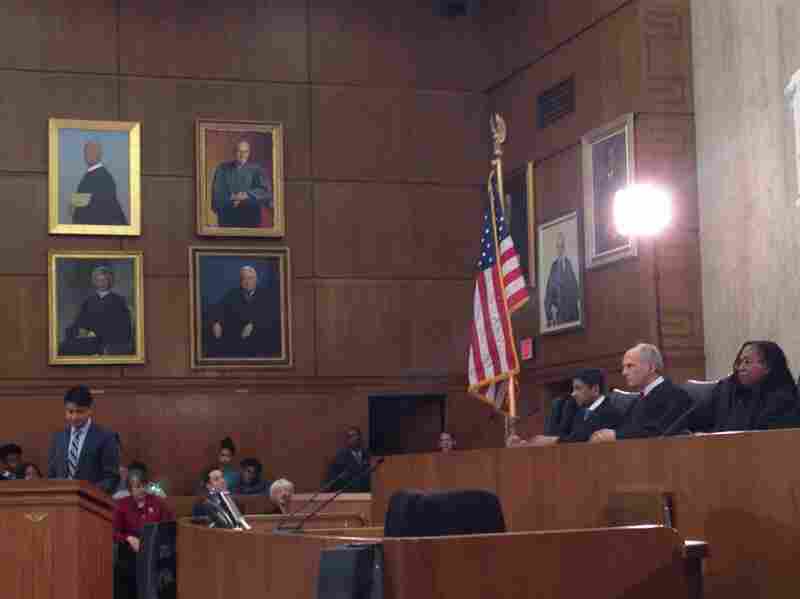 After that prologue, the judges take their places on the bench, and using a condensed version of the official Supreme Court transcript, they play the roles of the justices who heard the case. Judge Tatel's law clerk, Zayn Siddique, playing the ACLU lawyer representing the Tinker family, faces a tough question from Judge Jackson: "The students were studying English or math and they — they're also supposed to be thinking about the Vietnam War, according to Ms. Tinker? Isn't that going to be a distraction to the students?" "No, I don't think so," replies Siddique, as the lawyer for Tinker. "I believe that the method the students chose was designed in a way that it would not cause any kind of disruption." Law clerk Zayn Siddique, at the lectern, argues as the lawyer for Tinker, before Judges Sri Srinavasan, David Tatel and Ketanji Jackson. Judge Tatel asks whether the same reasoning would apply to political buttons. Yes, replies Siddique. Judge Srinivasan jumps in: "Counsel, I suppose that you would concede that if the armband started fistfights, a principal could prohibit students from wearing them." "I think in that case," Siddique responds, "the school could probably ban whatever item caused the fight." "Did you say probably?" Judge Srinivasan asks, eyebrows raised. "I'm hesitant, Your Honor, because I can imagine a situation in which a student wants to wear a shirt with a relatively harmless message, but another student overreacts and starts a fight," says Siddique. "I think we'd have to look at how provocative the message actually was." Then it is time for the counsel for the other side to make its argument. "As we view it," says law clerk Nick Sansone, acting as the lawyer for the Des Moines School Board, "the right to freedom of speech on school premises must be weighed against the right of the school administrators to exercise reasonable judgment to avoid disruptions in schools." He goes on to tell the court that two of the boys who wore the armbands were subsequently punched. That prompts the following question from Judge Tatel: "Is that unusual? How many boys are normally punched each day in the Des Moines School system?" The lawyer for the school board replies to that question with a question of his own: "Does the school district have to wait until there is a disruption, or should it be allowed to take steps to prevent disruptions?" Muhanad Osman and Zebasil Ayalew, seventh-graders at the School Without Walls, talking with Tinker. "What if the students had worn black ties instead to mourn fallen soldiers in Vietnam?" Judge Tatel asks. Sansone replies that such decisions should be left up to the school administrators. Moments later, Judge Srinivasan announces the decision of the court. Students are persons under the Constitution, he says. "They have rights which the government must respect. In our country, students may not be forced to express only those views that are officially approved by school administrators." Then comes the dissent, voiced by Judge Jackson. "One does not need special powers to see that after today's decision some students in Iowa schools and in schools across the country will be ready, able and willing to defy practically all of their teachers' orders. Accordingly, I dissent." Later, as the students munched on pizza in the court atrium, several took issue with the dissent. "Just because students broke one rule for a certain reason because they believed that a rule was unjust, I don't think that means that students will try to break every rule." Sarahti Grassamalla said. And many were inspired by Mary Beth Tinker. Soracha McGrath, high school senior at School Without Walls, reflects on the re-enactment of Tinker v. Des Moines Independent Community School District. "I was just very interested in how they stood up and fought for what they believed in. I want to be the same," said Johneice Marquez. "Like she wasn't scared to stand up for what she believed in," added Christian Starghill. Overall, the kids seemed impressed that this 50-year-old case was relevant to their lives. "It was just so amazing," Soracha McGrath remarked. "Even though it was so long ago, it is still so prevalent today." "I was really excited to see it, and how this case changed other cases as well." Momona Hadish said. "This was my first time being at a court in general," said a wide-eyed Tyler Davis. "So I really liked it."